From the Old Town Square walk 3 minutes along Dlouha street. El Mojito Cocktail Bar is on the left-hand side. El Mojito in Prague is a terrific little bar located on Dlouha street, a popular area for bars and restaurants not far from the Old Town Square. El Mojito feels a bit like a Spanish holiday bar. Unlike some of the smarter cocktail bars in town, there is no need to dress up for this one. Drop by any time after 4pm, order one of their special freshly made cocktails or huge glasses of Sangria, and soak up the atmosphere. Fresh fruit and careful attention to detail is the key to their excellent blends, which we rate as amongst the best in Prague. The frozen Margaritas have some rare options, such as forest fruits, and I doubt you will find a better Tequila Sunrise anywhere. In fact, with over 200 cocktails on the drinks menu to choose from, including 15 different Mojitos alone, your favourite should be there somewhere. If you just fancy a beer, they have a couple of Czech varieties on tap, and at reasonable prices for the Old Town. Plus, there are wines, sparkling wines, shots and coffees on offer too. 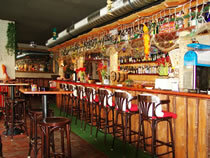 El Mojito is a relaxed bar with a buzz, where people come to talk, enjoy the music, and savour their drinks. Cosy lighting and a mixture of chill out British and Latin tunes keep you buzzing along in good spirits. It's a great bar to spend the evening in, but equally it's an ideal place to fuel up in as you make your way around town exploring the Prague nightlife.